Preheat oven to 350F/180C degrees. Grease a 12-cup bundt pan and set aside. In a medium bowl sift flour, cocoa powder, baking soda, salt, and cinnamon. Set aside. In a mixer bowl fitted with the paddle attachment, beat together butter and sugar on medium-high speed for 3-4 minutes until light and fluffy. Beat in the eggs one at a time until combined. Scrape down the sides and bottom of the bowl as necessary. Beat in vanilla extract. On low speed, beat in (or fold by hand) the flour mixture in 3 additions, alternating it with the wine in 2 additions (starting and ending with the flour). Do not overmix. Scrape the batter into the prepared pan and smooth the top. Bake for 45 minutes or until a toothpick inserted into the center comes out clean. Allow the cake to cool in the pan for 10 minutes on a wire rack, then turn it out and let it cool completely. 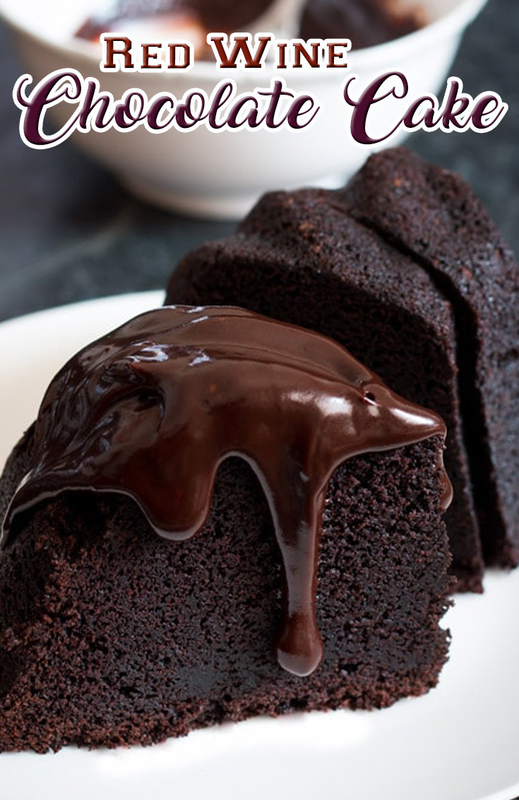 Dust the cake with powdered sugar or drizzle chocolate ganache over the cake. Store cake at room temperature in airtight container for up to 3 days.